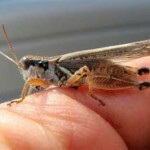 The U.S. Department of Agriculture says it is likely that Western plains states will be hit by the largest grasshopper infestation in 25 years. But that’s not all. 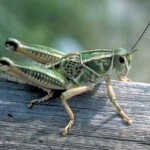 Mormon crickets, technically not crickets but shieldbacked, cannibalistic katydids, also are likely to have a banner year, swarming with their grasshopper cousins over roads, fields, fences, barns, hanging laundry and just about anything else they can chomp onto. The population boom is happening in parts of Idaho, Montana, Nebraska, South Dakota and Wyoming, according to the USDA. The department reports that normally, there are about eight insects per square yard. Last year’s surveys found 15, and that could hit 60 this summer in peak areas. But that’s not all. The department’s grasshopper abatement budget of $5.6 million is gone—used up by … counting grasshoppers, according to the office of Wyoming Gov. 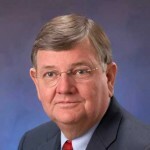 Dave Freudenthal. According to the Nebraska State Historical Society, “This bug-eater business is said to have originated during the potato-bug and grasshopper times. An eastern man came out here to visit his relatives. On his return they asked him, of course, how things were in Nebraska? Others embraced the name. 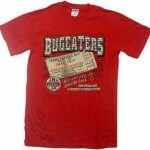 The University of Nebraska’s football team, between 1892 and 1890, was knows officially as the Big-Eaters, and even today one can purchase “Bug-Eater”sports paraphernalia. Grasshopper infestations are cyclical, rising quickly for two to three years, then dropping just as fast when the insects run out of food or a disease spreads through overcrowded swarms. Given last year’s rise, agriculture officials say this summer should be the crest. 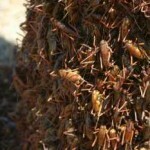 The insects also can be a traffic problem, particularly in the case of the Mormon cricket. Cannibals that they are, these crickets attack the cricket in front of them every few seconds and must move constantly forward to avoid attacks from behind. When a large band crosses a road it can cause a safety hazard by causing distracted revulsion on the part of the driver, and by causing the road surface to become slick with their fluids.